The first thing to understand about the OpenMM “application layer” is that it is not exactly an application in the traditional sense: there is no program called “OpenMM” that you run. Rather, it is a collection of libraries written in the Python programming language. Those libraries can easily be chained together to create Python programs that run simulations. But don’t worry! You don’t need to know anything about Python programming (or programming at all) to use it. Nearly all molecular simulation applications ask you to write some sort of “script” that specifies the details of the simulation to run. With OpenMM, that script happens to be written in Python. But it is no harder to write than those for most other applications, and this guide will teach you everything you need to know. There is even a graphical interface that can write the script for you based on a simple set of options (see Section 4.5), so you never need to type a single line of code! Follow these instructions to install OpenMM. There also is an online troubleshooting guide that describes common problems and how to fix them (http://wiki.simtk.org/openmm/FAQApp). There are two ways to install OpenMM: using the Conda package manager (http://conda.pydata.org), or with standalone installers. (A third option is to compile it from source, which is discussed in Chapter 9.) Using Conda is the easier method, and is recommended for most users. It is described first, and then the following sections describe how to use the standalone installers for various platforms. Conda is included as part of the Anaconda Python distribution, which you can download from http://docs.continuum.io/anaconda/install. This is a Python distribution specifically designed for scientific applications, with many of the most popular mathematical and scientific packages preinstalled. Alternatively you can use Miniconda (available from http://conda.pydata.org/miniconda.html), which includes only Python itself, plus the Conda package manager. That offers a much smaller initial download, with the ability to then install only the packages you want. (Optional) If you want to run OpenMM on a GPU, install CUDA and/or OpenCL. If you have an Nvidia GPU, download CUDA 8.0 from https://developer.nvidia.com/cuda-downloads. Be sure to install both the drivers and toolkit. OpenCL is included with the CUDA drivers. 1. Download the pre-compiled binary of OpenMM for Mac OS X from https://simtk.org/project/xml/downloads.xml?group_id=161, then double click the .zip file to expand it. 3. (Optional) If you have an Nvidia GPU and want to use the CUDA platform, download CUDA 8.0 from https://developer.nvidia.com/cuda-downloads. Be sure to install both the drivers and toolkit. 4. (Optional) If you plan to use the CPU platform, it is recommended that you install FFTW, available from http://www.fftw.org. When configuring it, be sure to specify single precision and multiple threads (the --enable-float and --enable-threads options). OpenMM will still work without FFTW, but the performance of particle mesh Ewald (PME) will be much worse. It will prompt you for an install location and the path to the python executable. Unless you are certain you know what you are doing, accept the defaults for both options. This will affect only the particular Terminal window you type it into. If you want to run OpenMM in another Terminal window, you must type the above command in the new window. 1. Download the pre-compiled binary of OpenMM for Linux from https://simtk.org/project/xml/downloads.xml?group_id=161, then double click the .zip file to expand it. 2. Make sure you have Python 2.7 or higher (earlier versions will not work) and a C++ compiler (typically gcc or clang) installed on your computer. You can check what version of Python is installed by typing python --version into a console window. If you have an AMD GPU, download the latest version of the Catalyst driver from http://support.amd.com. 4. (Optional) If you plan to use the CPU platform, it is recommended that you install FFTW. It is probably available through your system’s package manager such as yum or apt-get. Alternatively, you can download it from http://www.fftw.org. When configuring it, be sure to specify single precision and multiple threads (the --enable-float and --enable-threads options). OpenMM will still work without FFTW, but the performance of particle mesh Ewald (PME) will be much worse. This will affect only the particular console window you type it into. If you want to run OpenMM in another console window, you must type the above command in the new window. 1. Download the pre-compiled binary of OpenMM for Windows from https://simtk.org/project/xml/downloads.xml?group_id=161, then double click the .zip file to expand it. Move the files to C:\Program Files\OpenMM. 2. Make sure you have the 64-bit version of Python 3.3 or 3.4 (other versions will not work) installed on your computer. To do this, launch the Python program (either the command line version or the GUI version). The first line in the Python window will indicate the version you have, as well as whether you have a 32-bit or 64-bit version. 5. (Optional) If you plan to use the CPU platform, it is recommended that you install FFTW. Precompiled binaries are available from http://www.fftw.org. OpenMM will still work without FFTW, but the performance of particle mesh Ewald (PME) will be much worse. 6. Before running OpenMM, you must add the OpenMM and FFTW libraries to your PATH environment variable. You may also need to add the Python executable to your PATH. The files are typically located in a directory like C:\Python33. Remember this location. You will need to enter it, along with the location of the OpenMM libraries, later in this process. Add C:\Program Files\OpenMM\lib and C:\Program Files\OpenMM\lib\plugins to the “Variable value”. If you also need to add Python or FFTW to your PATH, enter their directory locations here. Directory locations need to be separated by semi-colons (;). If you installed OpenMM somewhere other than the default location, you must also set OPENMM_PLUGIN_DIR to point to the plugins directory. If this variable is not set, it will assume plugins are in the default location (C:\Program Files\OpenMM\lib\plugins). Let’s begin with our first example of an OpenMM script. It loads a PDB file called input.pdb that defines a biomolecular system, parameterizes it using the Amber99SB force field and TIP3P water model, energy minimizes it, simulates it for 10,000 steps with a Langevin integrator, and saves a snapshot frame to a PDB file called output.pdb every 1000 time steps. This line loads the PDB file from disk. (The input.pdb file in the examples directory contains the villin headpiece in explicit solvent.) More precisely, it creates a PDBFile object, passes the file name input.pdb to it as an argument, and assigns the object to a variable called pdb. The PDBFile object contains the information that was read from the file: the molecular topology and atom positions. Your file need not be called input.pdb. Feel free to change this line to specify any file you want, though it must contain all of the atoms needed by the force field. (More information on how to add missing atoms and residues using OpenMM tools can be found in Chapter 5.) Make sure you include the single quotes around the file name. OpenMM also can load files in the newer PDBx/mmCIF format: just change PDBFile to PDBxFile. This line specifies the force field to use for the simulation. Force fields are defined by XML files. OpenMM includes XML files defining lots of standard force fields (see Section 4.6.2). If you find you need to extend the repertoire of force fields available, you can find more information on how to create these XML files in Chapter 7. In this case we load two of those files: amber99sb.xml, which contains the Amber99SB force field, and tip3p.xml, which contains the TIP3P water model. The ForceField object is assigned to a variable called forcefield. This line combines the force field with the molecular topology loaded from the PDB file to create a complete mathematical description of the system we want to simulate. (More precisely, we invoke the ForceField object’s createSystem() function. It creates a System object, which we assign to the variable system.) It specifies some additional options about how to do that: use particle mesh Ewald for the long range electrostatic interactions (nonbondedMethod=PME), use a 1 nm cutoff for the direct space interactions (nonbondedCutoff=1*nanometer), and constrain the length of all bonds that involve a hydrogen atom (constraints=HBonds). Note the way we specified the cutoff distance 1 nm using 1*nanometer: This is an example of the powerful units tracking and automatic conversion facility built into the OpenMM Python API that makes specifying unit-bearing quantities convenient and less error-prone. We could have equivalently specified 10*angstrom instead of 1*nanometer and achieved the same result. The units system will be described in more detail later, in Section 12.3.4. Second, we specify includeDir=’/usr/local/gromacs/share/gromacs/top’. Unlike AMBER, which stores all the force field parameters directly in a prmtop file, Gromacs just stores references to force field definition files that are installed with the Gromacs application. OpenMM needs to know where to find these files, so the includeDir parameter specifies the directory containing them. If you omit this parameter, OpenMM will assume the default location /usr/local/gromacs/share/gromacs/top, which is often where they are installed on Unix-like operating systems. So in Example 4-3 we actually could have omitted this parameter, but if the Gromacs files were installed in any other location, we would need to include it. One option for writing your own scripts is to start with one of the examples given above (the one in Section 4.1 if you are starting from a PDB file, section 4.2 if you are starting from AMBER prmtop and inpcrd files, section 4.3 if you are starting from Gromacs gro and top files, or section 4.4 if you are starting from CHARMM files), then customize it to suit your needs. 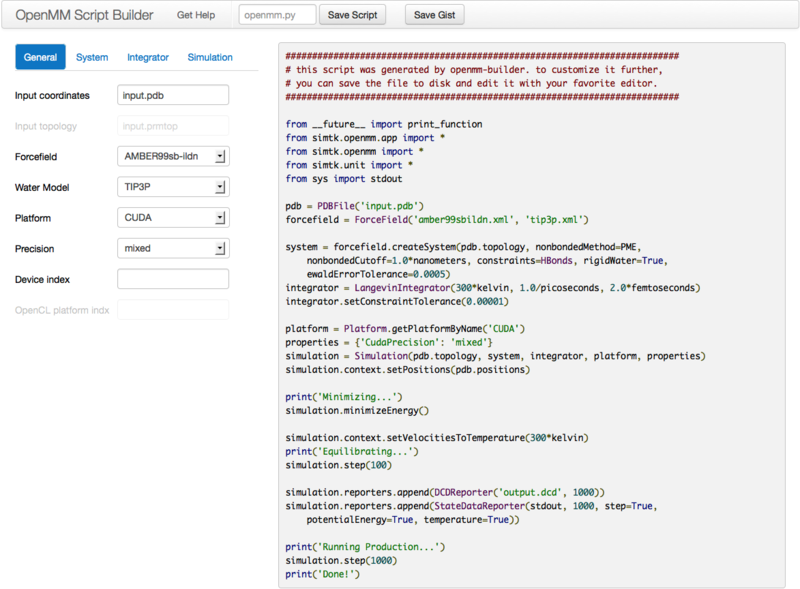 Another option is to use the OpenMM Script Builder application. This is a web application available at https://builder.openmm.org. It provides a graphical interface with simple choices for all the most common simulation options, then automatically generates a script based on them. As you change the settings, the script is instantly updated to reflect them. Once everything is set the way you want, click the Save Script button to save it to disk, or simply copy and paste it into a text editor. For the polarizable force fields (AMOEBA and CHARMM), only one explicit water model is currently available and the water parameters are included in the same file as the macromolecule parameters. Also, the polarizable force fields only include parameters for amino acids and ions, not for nucleic acids. Be aware that some force fields and water models include “extra particles”, such as lone pairs or Drude particles. Examples include the CHARMM polarizable force field and all of the 4 and 5 site water models. To use these force fields, you must first add the extra particles to the Topology. See section 5.3 for details. OBC2 Onufriev-Bashford-Case GBSA model using the GBOBCII parameters (corresponds to igb=5 in AMBER). This is the same model used by the GBSA-OBC files described in Section 4.6.2. Ewald Periodic boundary conditions are applied. Ewald summation is used to compute long range interactions. (This option is rarely used, since PME is much faster for all but the smallest systems.) Not valid for AMOEBA. PME Periodic boundary conditions are applied. The Particle Mesh Ewald method is used to compute long range interactions. There are three built-in ways to save the results of your simulation in OpenMM (additional methods can be written yourself or imported through other packages like mdtraj or parmed). If you are simply interested in saving the structure, you can write it out as a PDB file using PDBFile.writeFile(). You can see an example of this in the modeller section 5.5. There is a third way to save your simulation, known as a checkpoint file, which will save the entire simulation as a binary file. It will allow you to exactly continue a simulation if the need arises (though whether the simulation is deterministic depends on platform and methods, see 11.4). There are important caveats to this approach, however. This binary can only be used to restart simulations on machines with the same hardware and the same OpenMM version as the one that saved it. Therefore, it should only be used when it’s clear that won’t be an issue. In the previous chapter, we looked at some basic scripts for running simulations and saw lots of ways to customize them. If that is all you want to do—run straightforward molecular simulations—you already know everything you need to know. Just use the example scripts and customize them in the ways described in Section 4.6. The remaining attributes are specific to the virtual site class, and specify the parameters for calculating the site position. For a TwoParticleAverageSite, they are weight1 and weight2. For a ThreeParticleAverageSite, they are weight1, weight2, and weight3. For an OutOfPlaneSite, they are weight12, weight13, and weightCross. For a LocalCoordinatesSite, they are wo1, wo2, wo3, wx1, wx2, wx3, wy1, wy2, wy3, p1, p2, and p3. Every <Angle> tag defines a rule for creating harmonic angle interactions between triplets of atoms. Each tag may identify the atoms either by type (using the attributes type1, type2, ...) or by class (using the attributes class1, class2, ...). The force field identifies every set of three atoms in the system where the first is bonded to the second, and the second to the third. For each one, it searches for a rule whose atom types or atom classes match the three atoms. If it finds one, it calls addAngle() on the HarmonicAngleForce with the specified parameters. Otherwise, it ignores that set and continues. angle is the equilibrium angle in radians, and k is the spring constant in kJ/mol/radian2. Every child tag defines a rule for creating periodic torsion interactions between sets of four atoms. Each tag may identify the atoms either by type (using the attributes type1, type2, ...) or by class (using the attributes class1, class2, ...). Every child tag defines a rule for creating Ryckaert-Bellemans torsion interactions between sets of four atoms. Each tag may identify the atoms either by type (using the attributes type1, type2, ...) or by class (using the attributes class1, class2, ...). Each <Torsion> tag defines a rule for creating CMAP torsion interactions between sets of five atoms. The tag may identify the atoms either by type (using the attributes type1, type2, ...) or by class (using the attributes class1, class2, ...). The force field identifies every set of five atoms that are bonded in sequence: 1 to 2, 2 to 3, 3 to 4, and 4 to 5. For each one, it searches for a rule whose atom types or atom classes match the five atoms. If it finds one, it calls addTorsion() on the CMAPTorsionForce with the specified parameters. Otherwise, it ignores that set and continues. The first torsion is defined by the sequence of atoms 1-2-3-4, and the second one by atoms 2-3-4-5. map is the index of the map to use, starting from 0, in the order they are listed in the file. Every <Angle> tag defines a rule for creating custom angle interactions between triplets of atoms. Each tag may identify the atoms either by type (using the attributes type1, type2, ...) or by class (using the attributes class1, class2, ...). The force field identifies every set of three atoms in the system where the first is bonded to the second, and the second to the third. For each one, it searches for a rule whose atom types or atom classes match the three atoms. If it finds one, it calls addAngle() on the CustomAngleForce. Otherwise, it ignores that set and continues. The remaining attributes are the values to use for the per-angle parameters. All per-angle parameters must be specified for every <Angle> tag, and the attribute name must match the name of the parameter. For instance, if there is a per-angle parameter with the name “k”, then every <Angle> tag must include an attribute called k.
Every child tag defines a rule for creating custom torsion interactions between sets of four atoms. Each tag may identify the atoms either by type (using the attributes type1, type2, ...) or by class (using the attributes class1, class2, ...). CustomNonbondedForce also allows you to define tabulated functions. See section 7.2.20 for details. CustomGBForce also allows you to define tabulated functions. See section 7.2.20 for details. Every <Donor> or <Acceptor> tag defines a rule for creating donor or acceptor groups. The number of atoms specified in each one must match the value of particlesPerDonor or particlesPerAcceptor specified in the parent tag. Each tag may identify the atoms either by type (using the attributes type1, type2, ...) or by class (using the attributes class1, class2, ...). The force field considers every atom in the system (if the number of atoms is 1), every pair of bonded atoms (if the number of atoms is 2), or every set of three atoms where the first is bonded to the second and the second to the third (if the number of atoms is 3). For each one, it searches for a rule whose atom types or atom classes match the atoms. If it finds one, it calls addDonor() or addAcceptor() on the CustomHbondForce. Otherwise, it ignores that set and continues. The remaining attributes are the values to use for the per-donor and per-acceptor parameters. All parameters must be specified for every tag, and the attribute name must match the name of the parameter. For instance, if there is a per-donor parameter with the name “k”, then every <Donor> tag must include an attribute called k.
CustomHbondForce also allows you to define tabulated functions. See section 7.2.20 for details. CustomManyParticleForce also allows you to define tabulated functions. See section 7.2.20 for details.